This iconic sign once stood on the southeast shore of Oswego Lake. The Lake Oswego Preservation Society commissioned local artist Mary Ann Kunkel, to create original artwork based on a 1947 image of the Morris swim park sign in the Society’s collection. The distressed-looking metal sign is 12.5 x 16 inches and is available for $30 plus $9 shipping. Each sign comes ready to hang, inside or outside. Signs are $30 each; plus $9 shipping for online orders. Signs are also available online through the Lake Oswego Preservation Society. Renowned Northwest artist, Paul A. Lanquist, designed these 18″ x 24″ 12-color giclée print posters celebrating Lake Oswego’s architectural heritage exclusively for the Lake Oswego Preservation Society. Proceeds from poster sales are earmarked for a special preservation fund. Each unique piece represents an historic site in Lake Oswego and makes a beautiful addition to any home. Collect all four - fall, winter, spring and summer - in the series. An individual poster is $25. Posters are available through the City Store at City Hall and online through the Lake Oswego Preservation Society. For the first time in 54 years, a Lake Oswego resident has written a published history of the town. With tales of a mayor who knew the town’s cows by name and a singing pig drunk on moonshine, Colver captures the quirky anecdotes of Lake Oswego’s past. In the twentieth century, visionary real estate developers touted Oregon’s Lake Oswego as an ideal place to “live where you play,” a reputation the city maintains today. But this playful paradise is a far cry from the small town developed by iron company entrepreneurs in the nineteenth century. Colver chronicles the transition from gritty to pretty by recounting the people and events that shaped Lake Oswego. From bathing suit bans to a robot circus, enjoy the legacy of unusual facts, some recently discovered, that inspired Lake Oswego Vignettes. All proceeds from the sale of the book benefit the Lake Oswego Preservation Society, a non-profit corporation whose mission is to support Lake Oswego’s historic fabric through advocacy and education. $5 - 12 different cards with envelopes. Available at the City Store in City Hall. The City is excited to offer a collection of note cards. This new collection of beautifully photographed cards features some of Lake Oswego’s most exciting events, scenic landscapes and popular places. 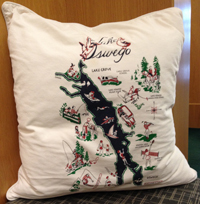 All proceeds from the sale of the pillow sham benefit the Lake Oswego Preservation Society, a non-profit corporation whose mission is to support Lake Oswego’s historic fabric through advocacy and education. All proceeds from the sale of the postcards benefit the Lake Oswego Preservation Society, a non-profit corporation whose mission is to support Lake Oswego’s historic fabric through advocacy and education. $35 - Available at the City Store or the Library. In the mid-1970s, Lake Oswego Public Library staff and volunteers began collecting oral histories from Lake Oswego “old-timers”. Armed with little more than a typewriter, staff and volunteers worked diligently to transform these collected oral histories into the book In Their Own Words, which describes in vivid detail life in early Lake Oswego. The Library has updated this classic work. The new hardbound edition features photographs from the Lake Oswego Historic Photographs database, a CD of some of the interviews, and an index. 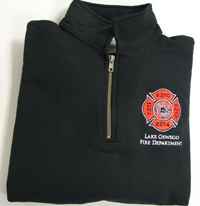 Also available for purchase at the Lake Oswego Parks and Recreation office in the West End Building and the City Store located in City Hall. The much anticipated Farmers’ Market Cookbook features over 75 wonderful and unique recipes from Farmers’ Market vendors, community members and local restaurants. This cookbook guides you on how to utilize the bounty available at the Lake Oswego Farmers’ Market. The City's personalized manhole cover, which displays the Clean Streams, Clear Choices Logo. Measures 25 inches in diameter, weighs 139 lbs. $125.25 (limited quantity; no mail delivery/pick-up only). Copies of the City's 32-page address atlas, with comprehensive multi-colored maps, are now available. (Shown: cover on left, paging index on right) $45.